Space is always an issue when it comes to ideas for remodeling our houses. Since most of the houses today are compact in dimensions, we feel quite baffled when faced with the idea of renovating it. And the challenge springs by leaps and bounds when we think of redesigning the compact bathrooms. With such limited space available, how will we ever come up with a better plan that changes the look of our small bathroom? Do you also want to increase the space of your bathroom? Are you running short of plans here? Well, let us help you with a bright idea! Buy a corner toilet for your bathroom and make the most of the space that you have. Out of all the various brands of corner toilets that are now available in the market, we have chosen few of the best for you. Keep reading to know about the best ones that you can pick from. The Cadet 3 corner toilet from the house of American Standard comes with a two-piece system that offers a truly appealing design as well as solid performance, along with considerably lesser clogs for the maximum length of time. You can pick from the variety of styles that are available in this Cadet 3 range of toilets. There are one piece and two piece styles of corner toilets to choose from, apart from the elongated models and the ones that come with rounded front bowls. The appropriate height of this cadet 3 model and its compact look makes it a very efficiently working product too, that can save water to a great extent. These water efficient models allow a flush of only 1.28 gallons every flush. The Cadet 3 range of corner toilets is an efficient performer and a versatile one too that delivers a flawless feat. The American Standard brand is a well known and highly trusted name in the sector of bathroom accessories and décor. This brand is reliable and has earned its goodwill by producing excellently performing products. Their products are available in well-designed looks that also meet our complete optimum performance as well as trust. The inventive features and elegant looks of this model of corner toilet make this a highly coveted one. When you install it in your bathroom, it will complement the bathroom décor and other fixtures beautifully. Moreover, its large flush valve generates a fast and powerful flush in just a matter of three seconds. It looks neat and comes with clear design lines and is great for use by those who suffer from back pains and have problems in bending or sitting down. 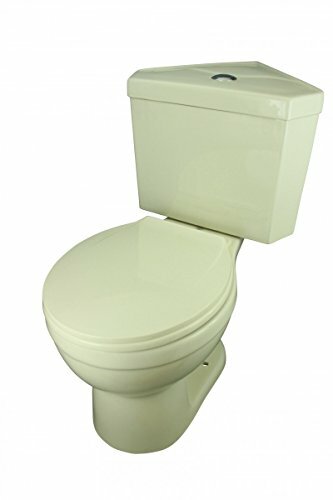 This compact and elegant looking corner toilet from the house of Renovator's Supply is one of the most reliable and valuable models that you will come across today. It will be the ideal addition to your bathroom and offer you the much-needed space and openness that you look for. Its superior corner design with the triangularly shaped cistern, not merely saves space but it also adds to the decor of your bathroom with the richness of its contemporary design ideas. The manufacturer, Renovator's Supply, has designed this product such that it meets all the guidelines related to EPA conservation of water. Now, coming to the features of this ceramic corner toilet, there is a dual-flush system built into it that can save nearly 25,000 gallons of water annually. This dual flushing technology is the latest and you will find it in all the regular toilet systems today. The flush of this corner can operate by the push-button that is included in its design. Also, it features a 0.8-gallon flush as well as another 1.6-gallon flush, which work in combination to save water to a great extent. The most attractive part of this corner toilet is its shade and design. The manufacturer has crafted this out of a brilliant white ceramic finish that not only shines but also offers excellent durability owing to the toughness of ceramic. The white shade looks clean and hygienic and will effectively complement any kind of bathroom décor. In case you are concerned about this product matching the existing fittings in your bathroom you can choose from the Pantone color match that they offer. This product has been built for long-lasting use and easy use. Its Reno gloss finishing adds to it a touch of classiness while it is also easy to clean. Moreover, the finishing makes sure that no scratches or stains can damage the look and whiteness of this corner toilet. The overall dimensions of this product are 31 inches in length, 18 and1/2 inches in width and 32 and ½ inches in terms of its projection. However, floor bolts and bolt covers are not sold inclusive of this package. Another brilliant product from Renovator’s Supply, you cannot miss this elegant corner toilet in your search for the best one. With its useful features, it is bound to be one of the most reliably performing corner toilets that you will find on the market. Its clean and neat design along with its triangle like cistern saves space and also complements the interiors of your small bathroom and the already existing fittings there. Renovator's Supply, the manufacturer, has taken all measures so that this product meets all the specifications for the EPA conservation. This corner toilet will be the perfect fitting in your compact bathroom and open up more space for a spacious look and feel.Now, when it comes to the features of this corner toilet made of premium porcelain, the best part is its water saving mechanism, which is brought about by the dual-flush system that has been built into it. With this advanced technology, it saves an estimated 25,000 gallons of water per year. This dual flush built in this corner toilet can be used by simply pushing a button. There are a 0.8-gallon flush and another 1.6-gallon flush, which work in together to save water. This elongated style corner toilet has been given a brilliant and rich finishing which makes it truly attractive. The manufacturer has endowed to it a rich and classy porcelain finishing touch that not only gleams but also offers excellent resistance to scratches and damages to its body. The white porcelain looks fresh and hygienic and is versatile enough to complement all styles of bathroom décor. You can also choose from the different Pantone color options available to match with the existing fixtures in your bathroom. This product makes sure that it stays in the perfect working condition for the longest period of time. Its Reno polish brings to it a dash of premium feel and look and also makes it really easy to maintain. The overall dimensions of this corner toilet are 32 and ¼ inches in length, 19 inches in width and 33 and 3/4 inches in terms of its projection. But bolts to secure it to the floor are not available as part of this package. This corner toilet, again from the house of Renovator’s Supply, is bound to be one of the best choices ever. With its many beneficial features and convenient design, it is sure to impress you with its performance compared to many others in the market. Its round design and the triangle like tank system, help in saving space and also in adding to a different look to your bathroom. Renovator's Supply, the manufacturer, has taken care in designing this product so that it meets all the specific criteria of EPA conservation of water. The round design of this corner toilet is available in a classy finishing that makes it very eye-catching. The premium finishing of bone china is not just to add visual appeal to this product, but also to offer effective resistance against scratches and stains on the body. The white clean look is hygienic, comes with a free good appeal and is also versatile to match all kinds of bathroom décor. You can also choose from the various color options that are available for this model, to go with the other fittings in the bathroom. This corner toilet, made out of top grade bone chine, will be the best fitting in your small bathroom that will effectively create the effect of more space inside your bathroom and offer more room for you to move around. And when it comes to its features, the best one is definitely the water saving technology. The dual-flushing system of this corner toilet makes it water efficient. With the use of this latest technology, you now get to save about 25,000 gallons of water every year, as estimated. It includes a flush of 0.8-gallon capacity and another flush of 1.6-gallon capacity, which work together for water saving. This dual flushing system of this corner toilet can simply operate with the help of a push button. This corner toilet is 31 inches in height, 18 and 1/2 inches in width and 32 inches in the projection. The Reno-Gloss polish imparted to it makes it look classy and brilliant. It is also very easy to maintain. It does not come with bolts to affix it to the floor as well as bolt covers. This round shaped corner toilet, from renowned manufacturers Renovator’s Supply, is one of the best products available for sure. This corner toilet is 29 inches in height, 17 and 1/4 inches in width and 30 inches in the projection and has been made truly compact for the best space saving facility. The rounded look of this model of corner toilet looks classy and comes in a very eye-catching form. Its triangular cistern and compact dimensions are great in saving space for adding an appealing touch to the look of your bathroom. Moreover, the manufacturer has taken care in the construction of this corner toilet, so that it conforms to all the criteria for EPA conservation system of water. When it comes to the most prominent features of this item, the best is certainly its water saving feature. The dual-flush of this item makes it extremely water efficient. Going by the latest technology, you can now easily save nearly 25,000 gallons of water in each year, as per estimations. There is a flush of 0.8-gallon capacity and another one of 1.6-gallon capacity, which works in conjunction to save water. You can easily operate the dual flush of this corner toilet with the help of its push-button system. Its rounded style and the classy porcelain finishing is not only to bring in that visual appeal to this product. It is in fact supper effective in offering resistance to any sort of stain or scratches from damaging the body. The white and clean look is hygienic no doubt and is also versatile. It can easily match up to any kind of bathroom interior decoration. The Reno-Gloss finishing looks refined and brilliant. But if you do not wish to choose white, there are other color options to choose from. This corner toilet, made out of top grade, durable porcelain, will shine brightly in your small bathroom and also create much more space inside. You will have enough space to move around and will n to have to squeeze yourself any more. It is also very easy to maintain. But, it does not include the floor bolts and covers which are needed to affix the corner toilet to the floor. Most of the users have expressed their immense delight at having bought the corner seat that suits their own requirements in the best possible manner. Starting with the American Standard corner toilet to the all the other ones manufactured by Renovator's Supply have already earned a 5-star rating from the users, which speak of their satisfaction. These brands are among the best-known names and offer the greatest level of customer satisfaction in terms of reliability and performance. The users feel that these products have delivered exactly as advertised by the manufacturers. They have offered the highest ratings to these products in terms of their dual flush mechanism, water saving facilities, design as well as compactness. These corner toilets are well performers and deliver every bit of value for the money sent by the consumers. Now, in the midst of rave reviews and excellent ratings, there are also some users who have expressed their dissatisfaction with their purchase. They have explained that owing to their short height, some of these corner toilets with their elevated heights are not exactly convenient for them to use. And some manufacturers did not include fastening bolts in the package which earned some flak. However, these are certainly negligible in comparison to the huge truckloads of benefits that they have derived from buying corner toilets from these well-known brands. With the huge variety of corner toilets available in the market nowadays, choosing the one that best suits your requirements can be hard to find. That is why we have come up with this list of the top rated products, where each of them has garnered rave reviews from users. In case you find it difficult to select the perfect one for your house, you can pick from any of the products shortlisted here. So, here's hoping that all your space-related problems are solved and you can now go about redesigning your bathroom interiors freely. What Is A Corner Toilet? As you can pretty well figure out from the name itself, corner toilets are ideal to set up in the corner of a bathroom. These corner toilets are the result of creative brilliant minds and can save a lot of space inside a bathroom. So even if you cannot really increase the space inside the bathroom, you can at least save a lot of space by installing one of these. Corner toilets are specially designed to come with a triangularly shaped tank, or more specifically, a pyramidal prism-shaped cistern. This difference in design than the regular ones makes a corner toilet much more appropriate and snug to fit into a corner easily. So with a special design and an unconventional shape, it not only looks eye-catching but also allows you to free up space in an already compact bathroom. Corner toilets function the same way like any other regular toilet system. These are best suitable for bathrooms that so small that you have squeeze yourself inside, let alone moving around! How Much Space Can A Corner Toilet Save? If there is very limited space available where you need to set up a toilet, going for the regular ones with a large enough cistern will definitely not be a practical option to choose. The regular sizes of toilets occupy much larger space and will therefore not be suitable to be fitted in places such as cloakroom suites or underneath the staircase. This is where the corner toilets can be of prime utility. Their compacted design saves much more space than any regular size toilet. In situations where you are looking for ways to increase more space inside your bathroom, so that you can move about, installing a corner toilet can save space to a great extent. Even if you do not find any option to remodel the bathroom by breaking down walls and reconstructing them, you can at least play around with whatever space is available to you. These corner seats are the perfect commodities which can make this happen. Since they need to be installed right at one corner, there will be no chance of blocking any extra space inside the bathroom or using up space meant for moving around, by jutting out of the walls. Why Would You Use A Corner Toilet? A corner toilet can be most useful if you are planning to redesign your bathroom in your small apartment. For many of us, having a spacious bathroom means a lot when it comes to choosing the best features in an apartment. Apart from the prime and most significant of saving more space, there are several other reasons why you can use a corner toilet inside your house. Let us take a look at all of them. ● Free up more spaceTo redesign your bathroom and make it look more spacious, so that you can at least move around, a corner toilet offers a feasible solution. With the intention of saving more space inside a cloakroom suite, these can be a wonderful choice too. When you have plans to de-clutter a cloakroom suit to make it appear more sorted, installing a corner toilet at one end is going to be one of the best ideas ever. ● Leave the walls intactFor the majority of us, tearing down the walls of our bathroom to increase space is not a feasible solution. For such cases, the best thing that can be done is install a corner toilet, and keep the original walls intact. ● Practical solutionIf you are looking to make effective use of all available spaces inside your house, you can buy a corner toilet. For spaces underneath the staircase or an unused closet inside a cloakroom suite, installing a corner toilet will be an excellent way to make use of space. If you are planning to convert any of the unused rooms into a guest room with a toilet, this is the most practical solution that is available. ● Eye-catching decorWith the contemporary styling and elegant designs of these corner toilets, you can achieve an elegant solution for your bathroom. The corner toilets typically come with a very unconventional design which makes them quite appealing. The tanks of corner toilets are mostly pyramid-shaped, which adds an attractive décor to the interiors of your bathroom. ● Add more to your bathroomInstalling the corner toilet opens up more space in our bathroom. Now, many of you may like to make use of this newly available space by adding some new and improved features to your bathroom. You might like to install a rain shower or a bathtub as per your wish. So the corner toilets also offer the scope to include more fixtures inside the bathroom, to make it more convenient for use. ● All features includedIf you think that using a corner toilet means making a lot of compromises in terms of missing features, then you are wrong. Most of the modern corner toilets come with the same set of features that are found in the regular toilets. A powerful flushing system and dual flush are included in the design of corner toilets. Moreover, these are also capable of saving water with the various features that are built into them. ● Ease of useSince corner toilets are slightly different in design than their regular or conventional counterparts, the height of seating is also a little higher than usual. That is, the level of the toilet seat is slightly higher up, as compared to a regular toilet system. This makes corner toilets very convenient to use, especially by those who suffer from certain problems. People who are ailing from pains due to trouble in their spinal cord will not need to bend down lesser to use a corner toilet. This is, therefore, beneficial to them. When space is an issue, finding a small corner toilet may be what you're looking for. Renovator's Supply's White Porcelain Round Space Saving Dual Flush Corner Toilet may just fit the bill. Weighing in at only 38.6 lbs, this full featured, water saving, compact corner toilet has many features in its compact size.